Johann Peries, Sri Lanka’s famed mountain climber and adventurer, is set to make his ascent to the peak of Mount Everest in a few days. If the weather clears, Johann hopes to leave Base Camp on Saturday 19th May, climbing up to Camp 3 by 21st May and on to Camp 4 by the next day, before making his bid for the summit on 23rd May. Johann has been in the Himalayas since April, when he began his Everest expedition as part of a larger team led by International Mountain Guides (IMG), a globally renowned mountaineering company with more than a dozen successful Mt. Everest Expeditions. For the past few weeks, Johann has been performing a series of climbing rotations which prepare the climbers for higher altitudes and the Himalayan terrain. Johann has completed three such training rotations, climbing all the way up to Camp 3 which is 7,162m above sea level and the fourth highest peak in the world. He has also been undergoing a series of ladder training exercises and other glacier-trekking exercises to help him prepare for the final stage of his Everest climb. Johann and other climbers have been experiencing bad weather throughout the current climbing season, and it is hoped the jet streams at the summit will ease in time for the final summit ascent. This last phase of Johann’s climb is the most treacherous and also most challenging – the area beyond Camp 4 and the Summit is known as the Death Zone because of its perilous conditions, where strong winds, narrow plateaus, steep ridges await the climbers and because in this zone the organs of the body start to slowly shut down because of the depleted oxygen saturation in the air. Johann has been in intense training for this climb since December 2017. This is Johann’s second attempt to summit Mount Everest. In April 2016, he and Jayanthi Kuru-Utumpala were the first Sri Lankans to attempt to summit the peak, but Johann was forced to turn back at 8,400m, a mere 448m short of reaching the summit, due to technical difficulties with his equipment. Kuru-Utumpala went on to complete the climb, becoming the first Sri Lankan to scale Mt. Everest. Encouraging Johann on this second Everest bid is the ‘Climb Everest with Johann’ campaign, which has drawn the support of hundreds of Sri Lankans through its dedicated website. The campaign allows Johann’s Fellow-Sri Lankans to sponsor each step he takes on the mountain for Rs.100 a step. The cost of Johann’s expedition is estimated to amount to USD 58,600 and each sponsored step goes towards these costs. 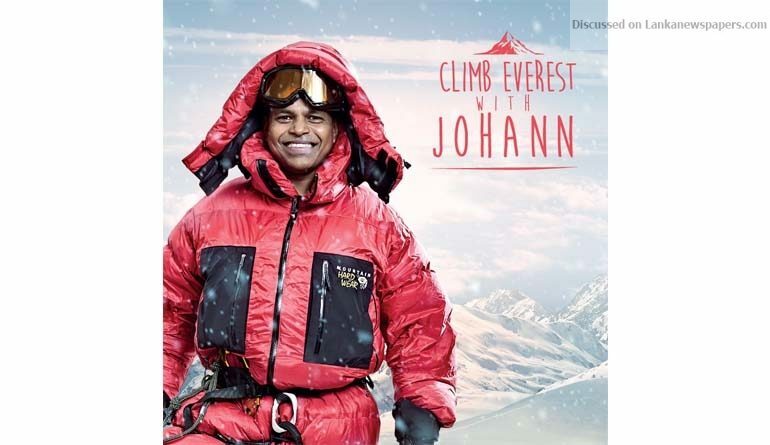 Johann has dedicated this Everest Expedition to all Sri Lankans, and he is hopeful of raising the Sri Lankan Flag at the Everest Summit in a few days.